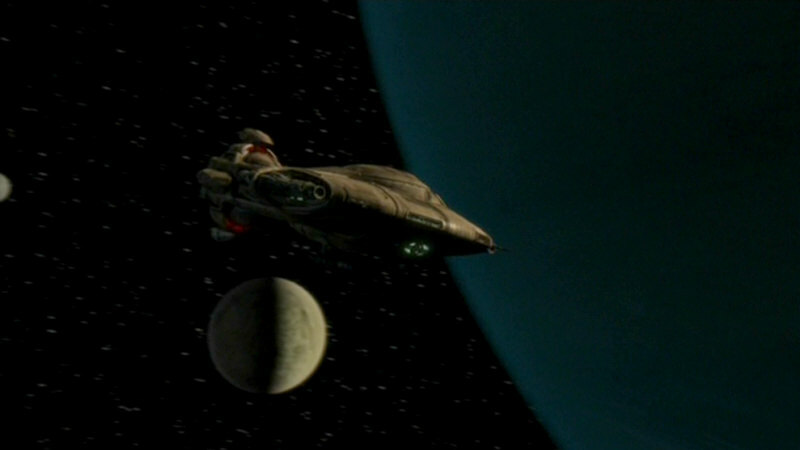 An alien shuttle was built for VOY: "Alice", both as an original size model and as a CGI. 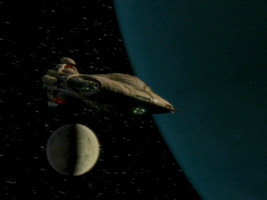 Variations of "Alice" appeared in two Enterprise episodes. 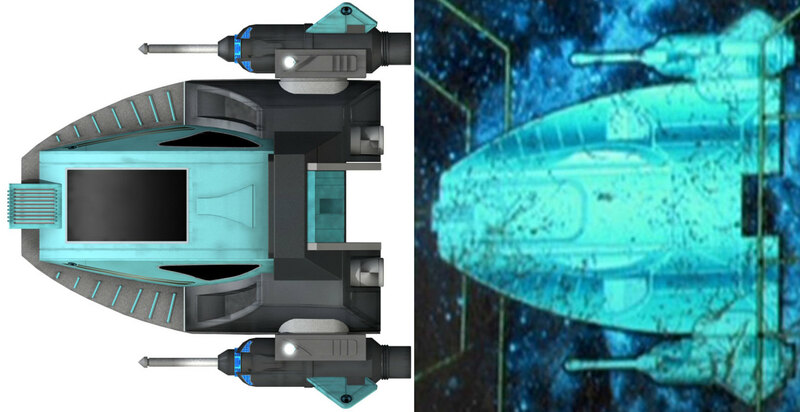 In this article we spotlight the modifications made to the design, and we investigate how well the CG model matches up with the life-size model of the corresponding alien ship. 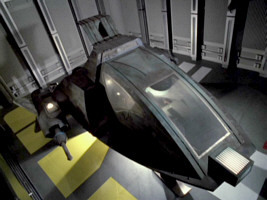 A new alien shuttle was required for the Voyager episode "Alice". 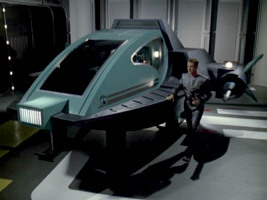 As the shuttle was not only meant to appear in space but also in the shuttlebay in many scenes, a life-size mock-up was built besides the usual CG model. 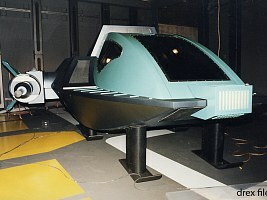 The mock-up could be filmed from the inside and from the outside. 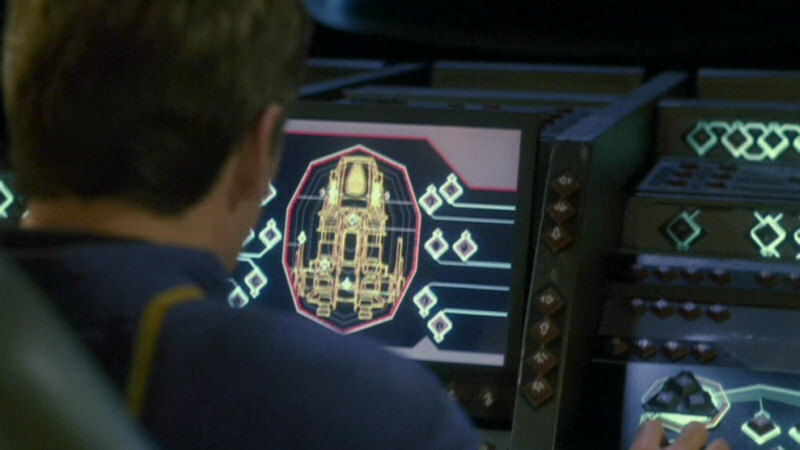 Also in this episode, we can see a static top view of the shuttle on the large forward cockpit console. 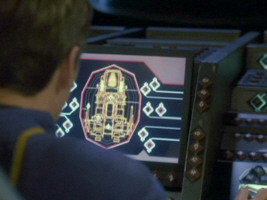 In addition, an animation of the shuttle was created, which is visible in two scenes on the viewscreens on USS Voyager. 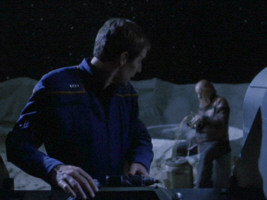 Thanks to Drex Files we have different views of the CG model in high resolution that we can compare with the appearances of the life-size model in the episode. 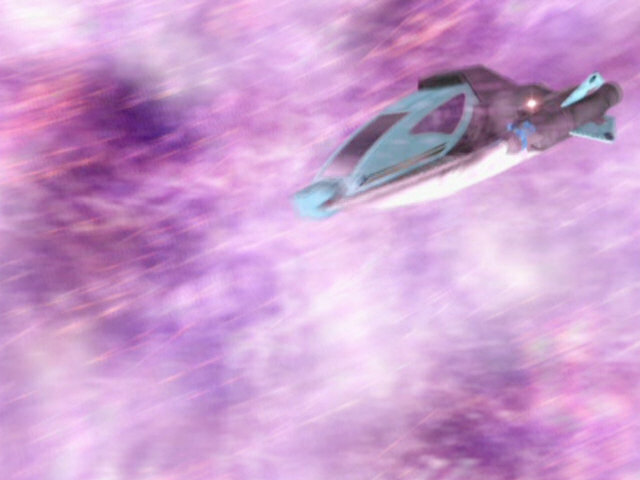 Although the eponymous shuttle "Alice" plays a crucial part in the episode, the CG model shows up in only four scenes. 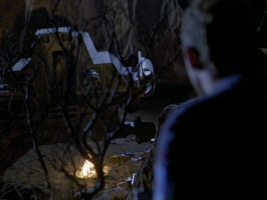 In the first scene, we can see it in Abaddon's repository of Lost Treasures. Here the shuttle is still dirty. It will be cleaned up by Tom Paris later in the episode. 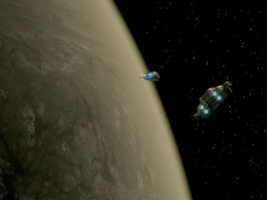 The clean shuttle can be seen as a CGI three times in the episode. 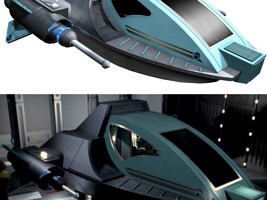 So we know that two versions of the CG model must have existed, a "dirty" one and a "clean" one. 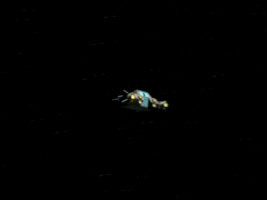 Alice CGI in VOY: "Alice"
The six engine exhaust nozzles of Alice are always yellow when active. 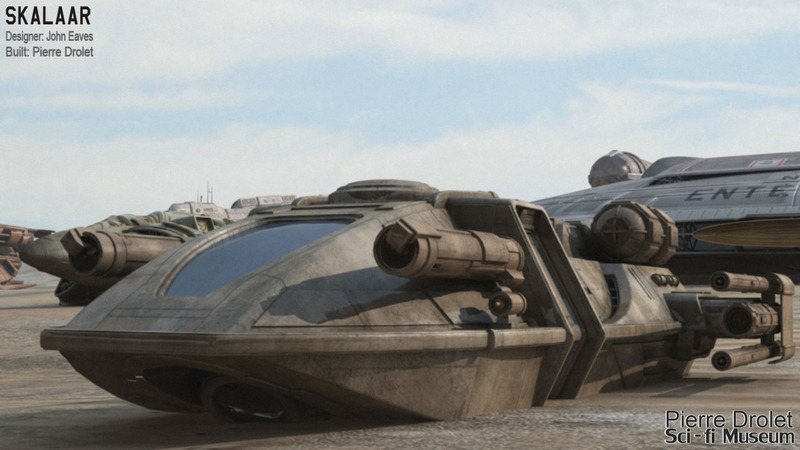 As far as we can recognize it, there are no major discrepancies between the CG model and the mock-up. We can see that on the mock-up the inner engine nozzles shine white in stand-by mode, whereas the outer ones are yellow, just as on the CG model. 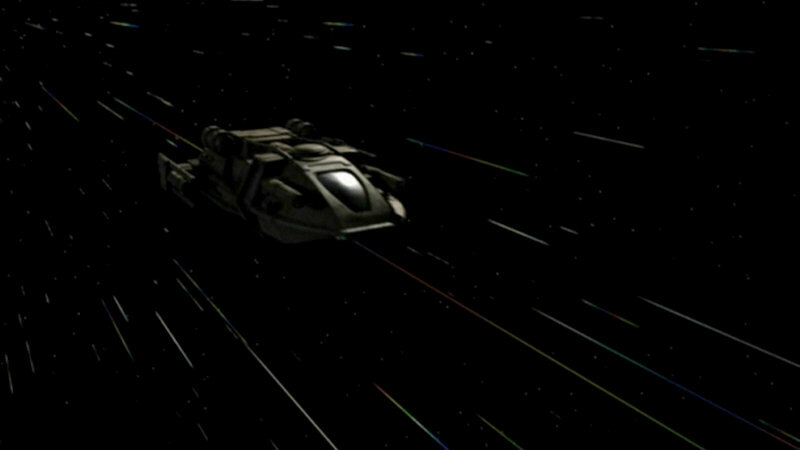 The engine spike is longer and thicker on the CG model, and the placement of the stripe and logo on the sides of the main hull is slightly different. 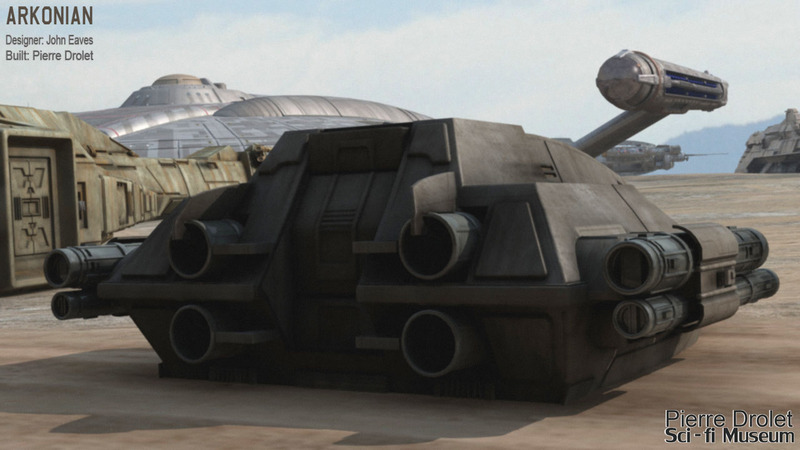 Overall, however, the differences are rather small and definitely unnoticeable in the episode itself, without access to larger renderings of the CG model. Alice mock-up in VOY: "Alice"
The cockpit of Alice bears a resemblance to that of the Type-9 shuttle, especially as the rear entrance hatch is concerned. 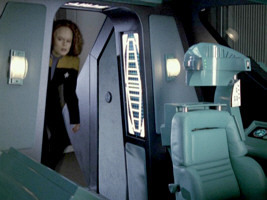 Still, the shuttle interior is not a redress but a newly built set. 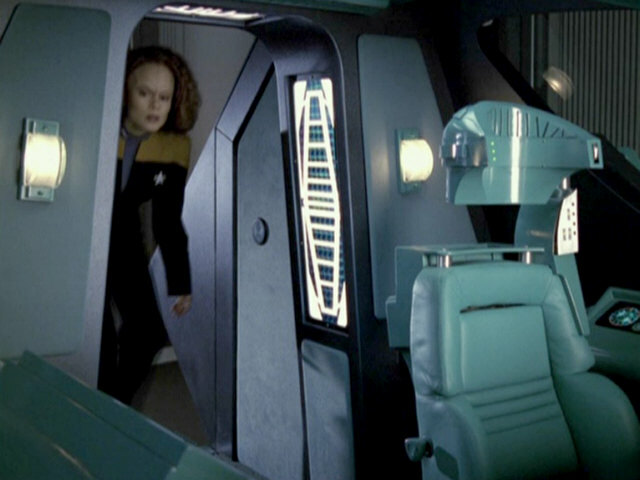 Alice interior in VOY: "Alice"
There are some more pronounced discrepancies between the graphics of the shuttle and the CG model. Looking at the static top view of the shuttle on the cockpit console, there are some differences to the corresponding view of the CG model (or to shots of the life-size mock-up). 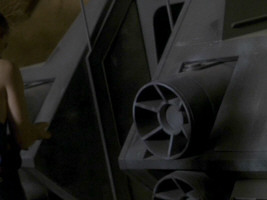 Firstly, the upper part of the frame of the cockpit window is rounded on the graphic, which is not the case on the CG model or the mock-up. Also, on the graphic the "box" in front of the window is smaller and does not stick out as much as it should. There are more discrepancies on the aft. 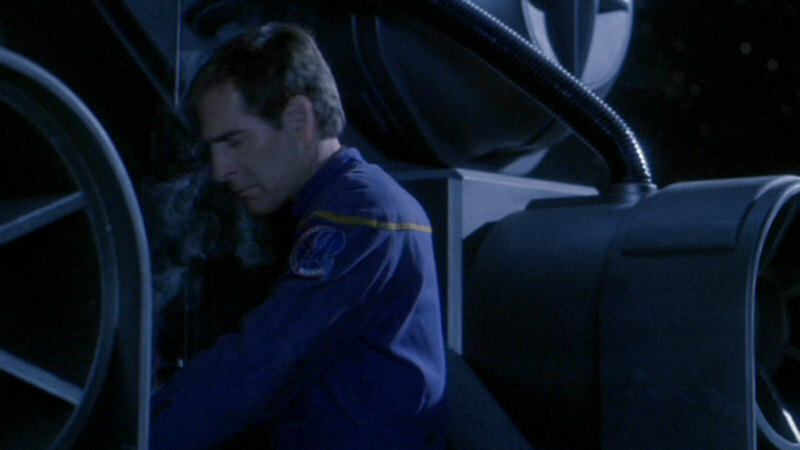 The aft entrance hatch is too narrow on the graphic, the engine nozzles are too short. Alice static graphic in VOY: "Alice"
The animation of the shuttle, as it appears in two scenes on an LCARS display on Voyager, comes with some more discrepancies. 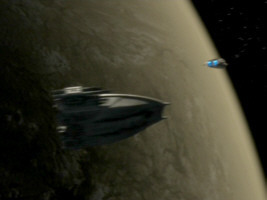 We can see immediately that the ship is way too elongated on the animated graphic. 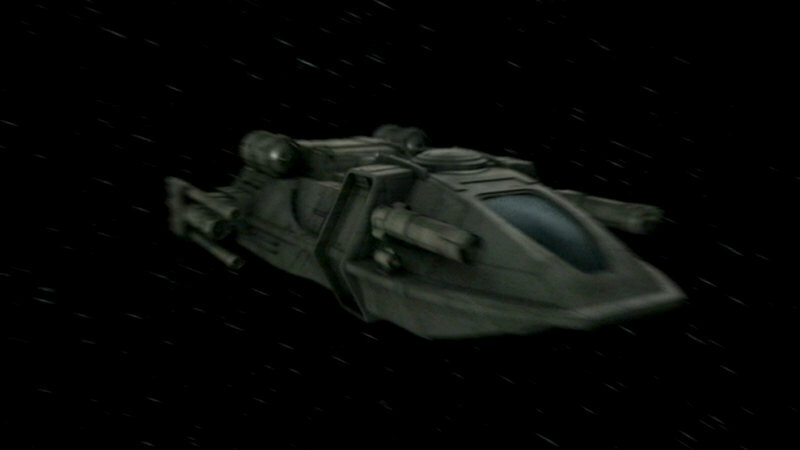 In addition, it appears to have two weapon arrays pointing forward from the cockpit that are not on the CG model or the mock-up. 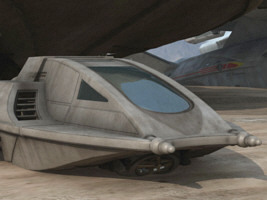 The cockpit window is rounded on the top as well as on the bottom in the animation. Looking at the aft end in the top view of the animation, the inner engines protrude too much from the hull and are too close together, leaving no space for a hatch. We can see the same problem on the aft view of the animation. Alice animation in VOY: "Alice"
The first re-use of the shuttle Alice is in the Enterprise episode "Dawn". In this episode we can see the CG model, as well as the aft section of a life-size mock-up of the Arkonian shuttle. 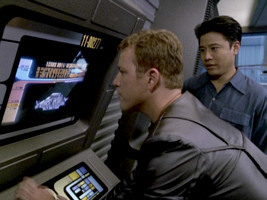 The cockpit of the shuttle is never shown. 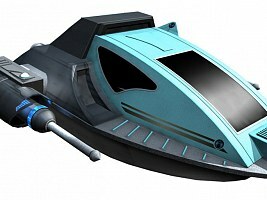 We also don't see any graphics or animations of the ship. 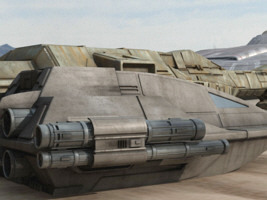 There are a few discrepancies between the CG model and the life-size mock-up, however. We start with a look at the CG model. 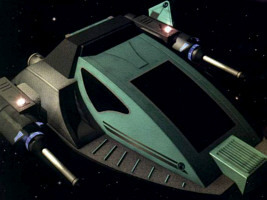 The exterior of the Arkonian shuttle was designed by John Eaves. 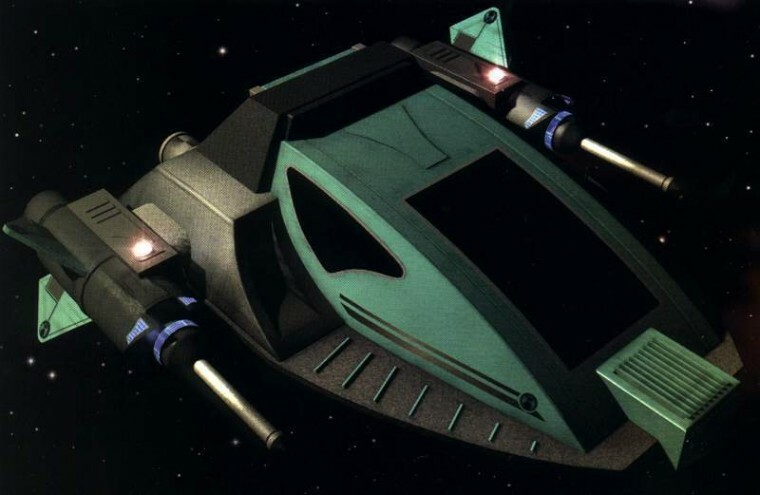 The CG model was then built by Pierre Drolet. Comparing the sketches by John Eaves with the views of the CG model by Pierre Drolet, we can see that they match almost perfectly. Looking back at the CG model of Alice, it becomes apparent that a couple of changes were made for it to become the Arkonian shuttle. The underside of the Arkonian version shows many more details than Alice. 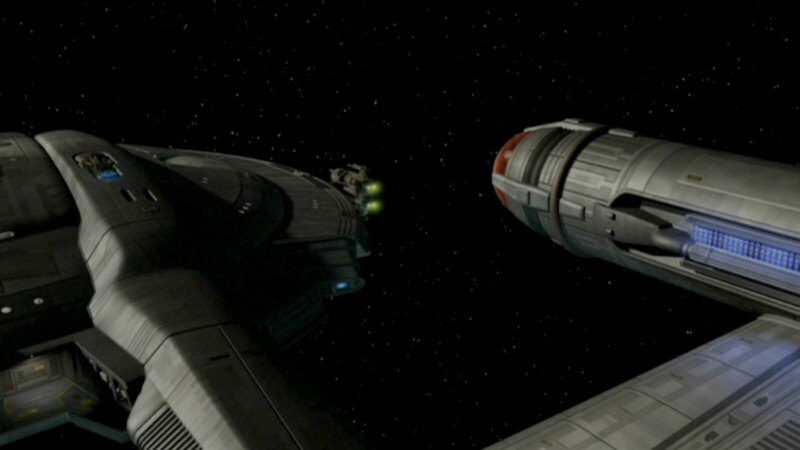 We can see some sort of new front deflector on the Arkonian shuttle that shines green. 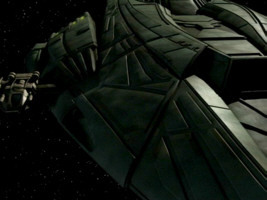 The Arkonian warship features a similar deflector. 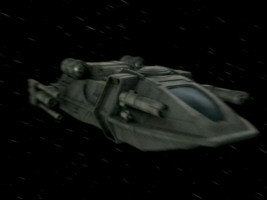 Arkonian shuttle CGI in ENT: "Dawn"
Arkonian warship in ENT: "Dawn"
The wings were changed substantially. 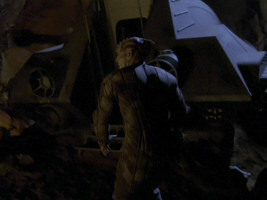 They were shortened and the two large engines with the metal spikes were removed. The two winglets on each engine are gone too. 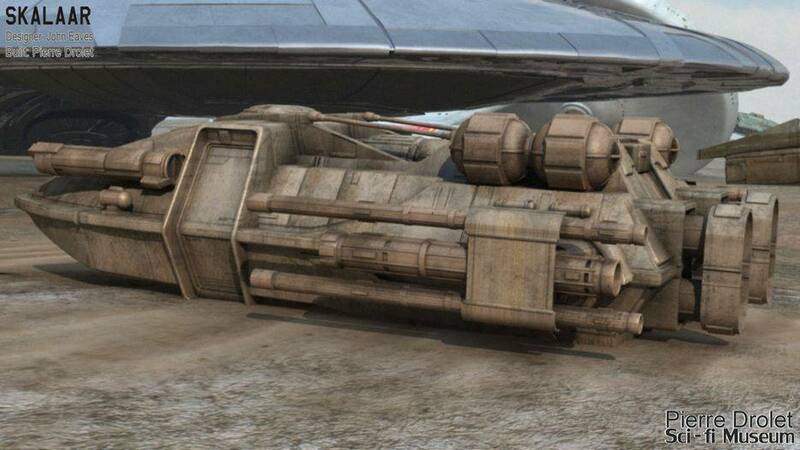 In place of each of the former large engines we can see two tubes, of which the upper one is somewhat thicker and shorter. 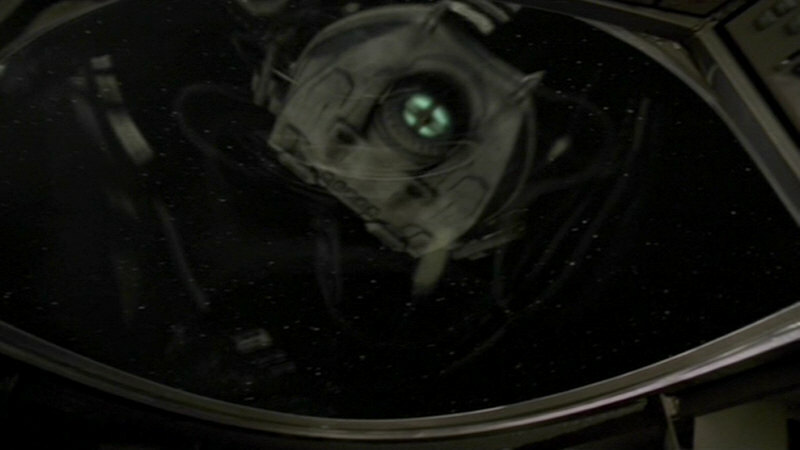 The four inner engines are still located in the same place as on Alice. They are now lighted blue. 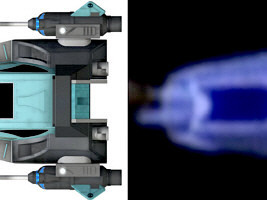 The upper engines sport some sort of wing that points upwards and partially cuts through the outer ring of the nozzle. There are also horizontal "boards" between the upper and the lower engines and the aft door. The "box" in front of the cockpit window was removed and two spikes added to the bow of the shuttle. The previously rectangular window was rounded and appears to be overall more arched. The big lateral windows were removed and replaced with two much smaller ones. The dark rollbar-like superstructure of Alice was lowered in a way that it became flush with the cockpit roof. Moreover, a grid was added to the openings that face forward on either side of the cockpit window. The comparison of the new CG model with the life-size aft end of the shuttle exhibits a couple of discrepancies. 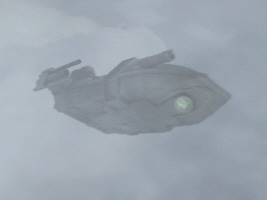 The four inner engines don't have the two vertical wings that were added to the CGI. 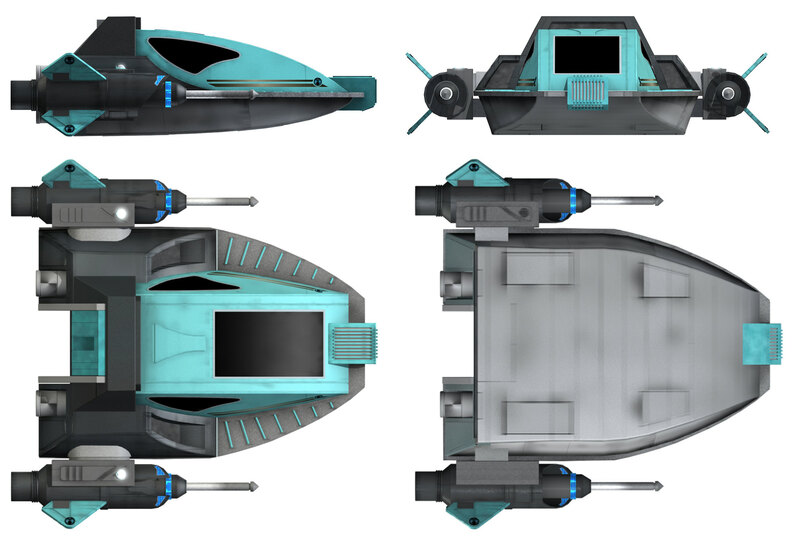 The four bars between the engines and the hatch are missing too. The engines still look like they did in "Alice". The same applies to the superstructure of the upper aft engines that is the same on the Alice and the Arkonian mock-up but not on the CG model of the latter. 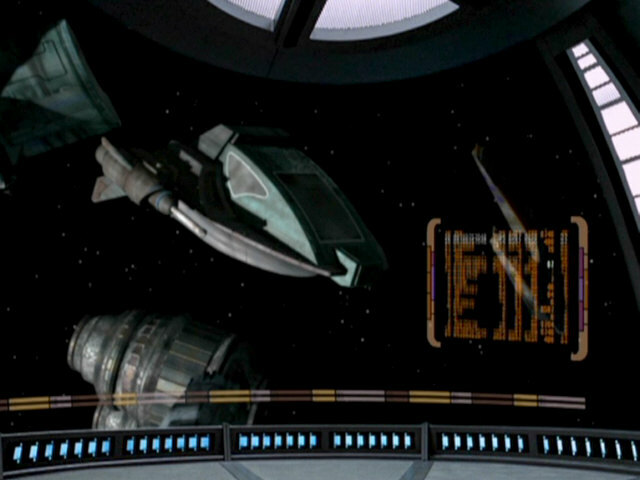 Arkonian shuttle mock-up in ENT: "Dawn"
One more difference is that the superstructure of the shuttle (the "rollbar") was not lowered on the mock-up. This may not have been possible because the mechanism for the upper part of the aft door was located there. On the sides of this superstructure on the mock-up, there are four raised lines that are missing on the CG model. 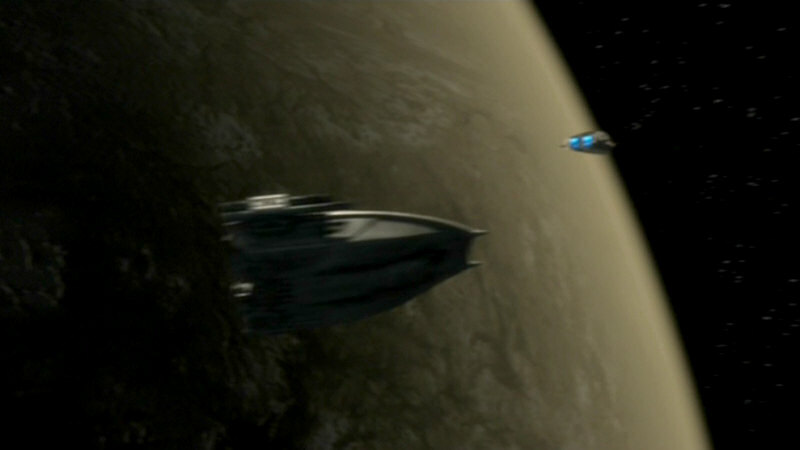 Also, we can see some sort of emblem on the side of the full-scale hull that the CGI doesn't have. In some shots of the mock-up from "Dawn" we can still see the outlines of the former lateral cockpit window of Alice. 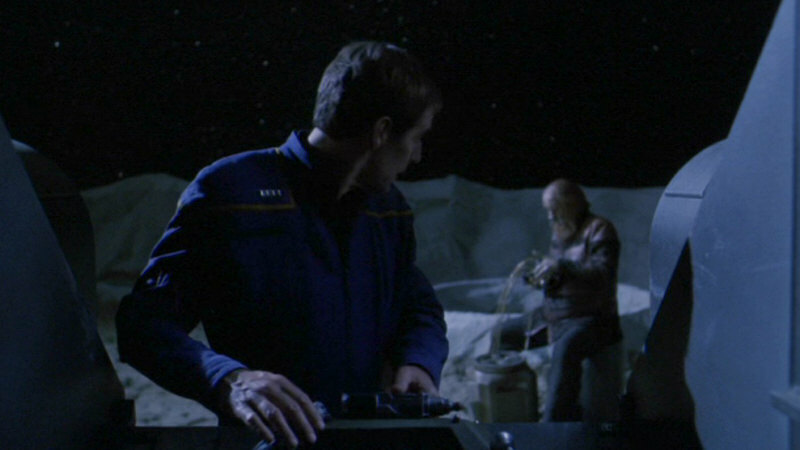 On the starboard aft end there is a "busy box" that Trip pulls out in the course of the episode. When the drawer is closed, we can make out its outlines on the mock-up, which are missing on the CG model. Summarizing, the physical model was not changed very extensively since "Alice" but a few details were added that are not on the CG model. 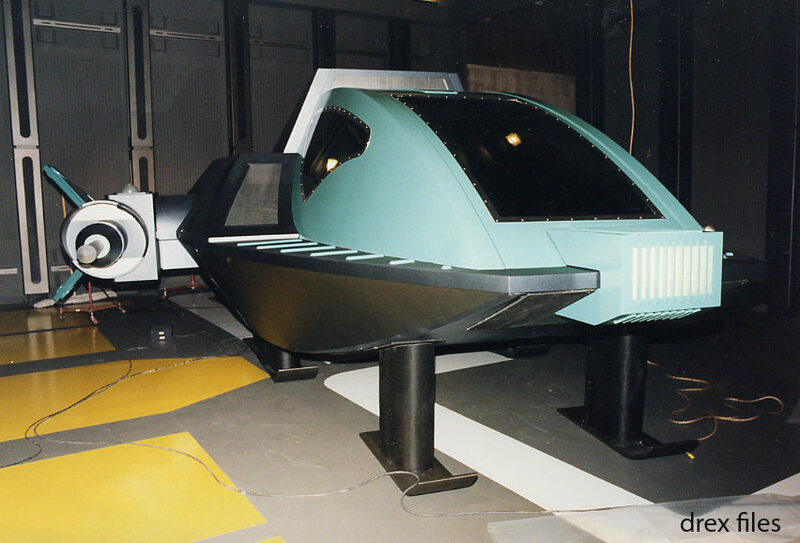 The CG model, on the other hand, was modified substantially and doesn't match as well with the mock-up as it could. 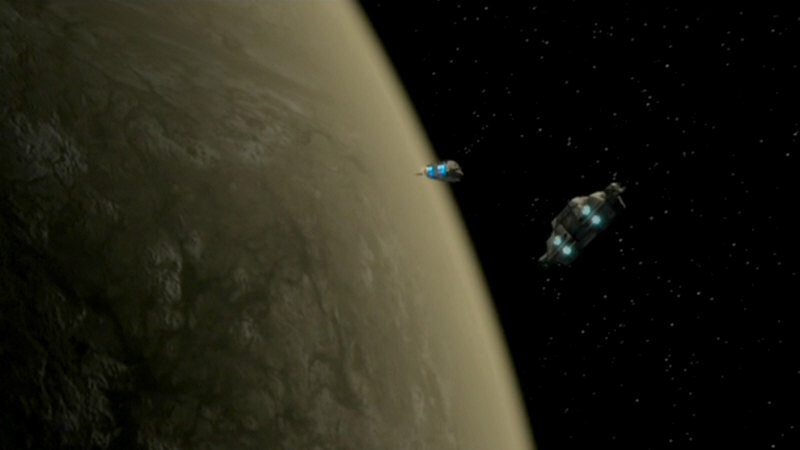 "Bounty" is the last episode with a CG model that includes parts of the shuttle Alice. Furthermore we can see the life-size shuttle mock-up (at least, its aft end) for the last time. 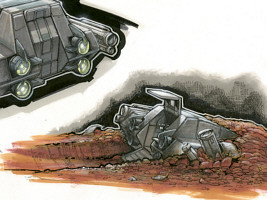 For the interior of the Tellarite shuttle, a new set was constructed of old parts. Parts of this set already appeared in previous Voyager and Enterprise episodes and would appear one more time in "Stratagem". We first look at the CG model and the aft end of the life-size shuttle. 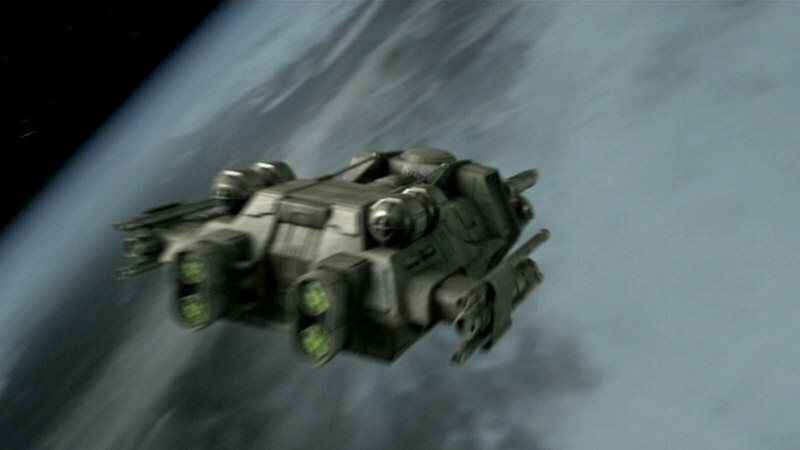 Like already the Arkonian version, the Tellarite shuttle was designed by John Eaves and built into a CG model by Pierre Drolet. 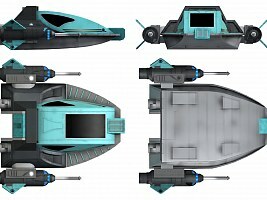 Pierre Drolet's website shows three nice views of the model. 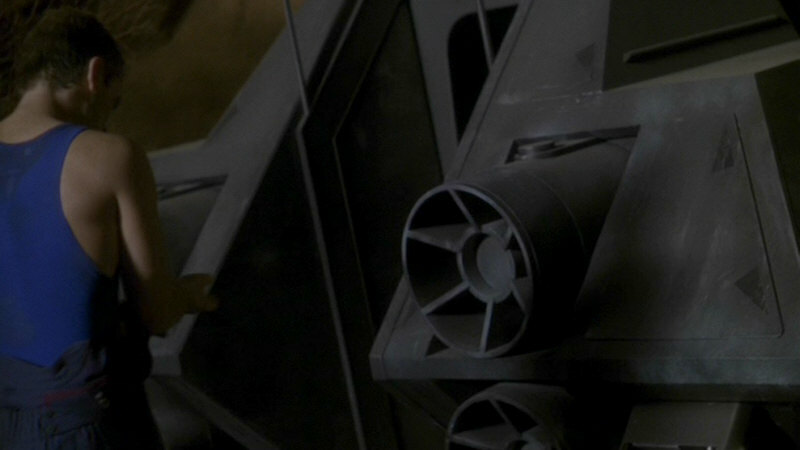 It is interesting to notice on the CG model that the wings with the two thin and the central thicker tube now look as they did on the mock-up already in "Dawn" but not on the CG model of that episode. 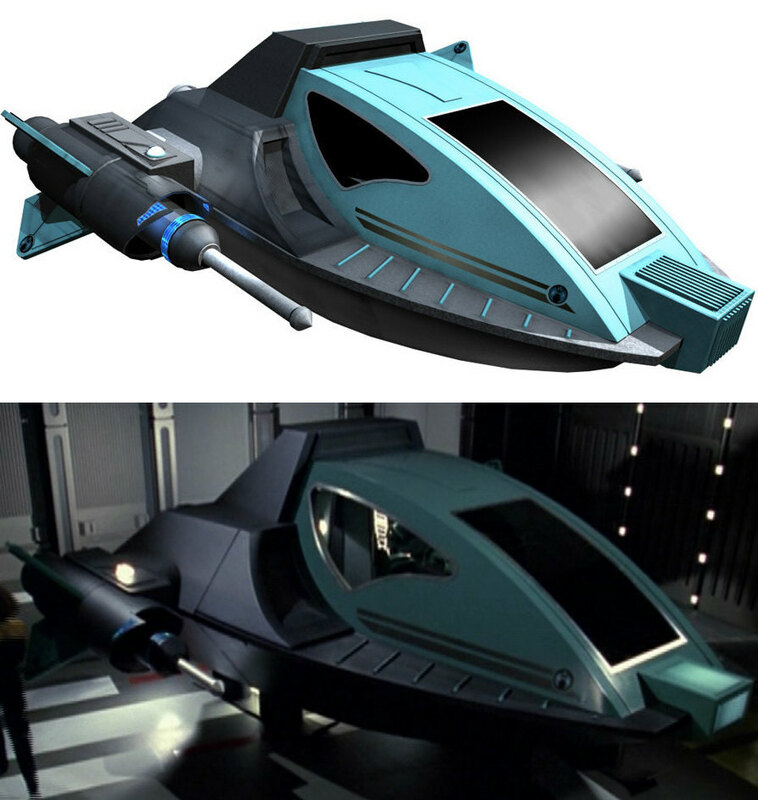 It is obvious that John Eaves (or Pierre Drolet) took into account the actual look of the mock-up and adapted the sketch (or the CG model) in order to get a better match at lower costs. It is also noticeable that the two wings are now somewhat longer, and the tubes are somewhat further apart from the shuttle's main body. The upper and lower of the four engine nozzles now have a common oval frame, and are placed on a raised panel, making them stick out further from the aft hull than previously. The engines now shine greenish. 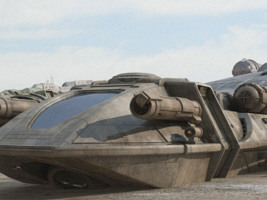 The upper, vertical fins of the model as they could be seen on the CGI in "Dawn" were removed. 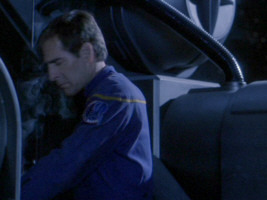 The four "boards" between the engines and the door, on the other hand, are still there. The door itself remains unchanged as well. 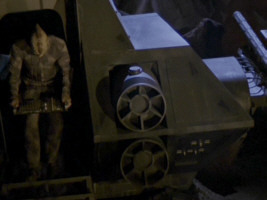 On the top of the shuttle CG model, on the port and starboard side, we can see two short cylindrical containers that are unmistakably based on the composter as it appeared in DS9: "Call to Arms" as a self-replicating mine. 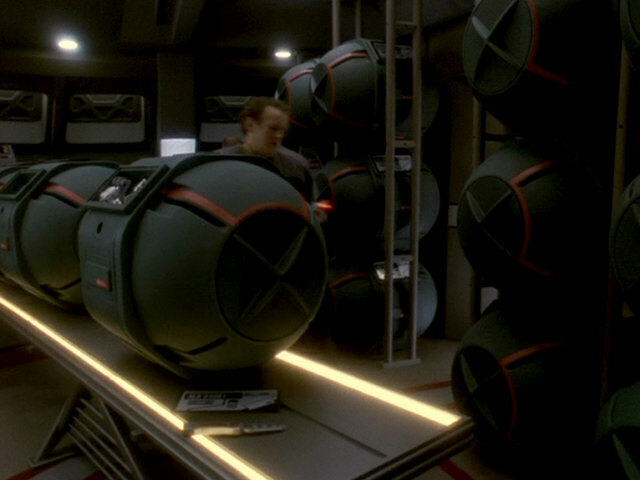 In some other episodes we could see the real-life containers as freight containers. 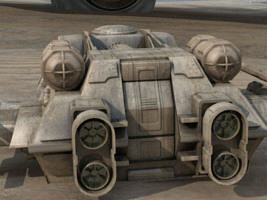 The fact that this detail was included to the CG model is a clear sign that the containers were added to the life-size model as well. 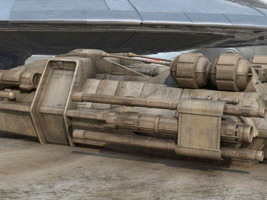 Before we investigate further modifications to the CG model, let us have a look at the rather brief appearance of the life-size shuttle model in "Bounty". 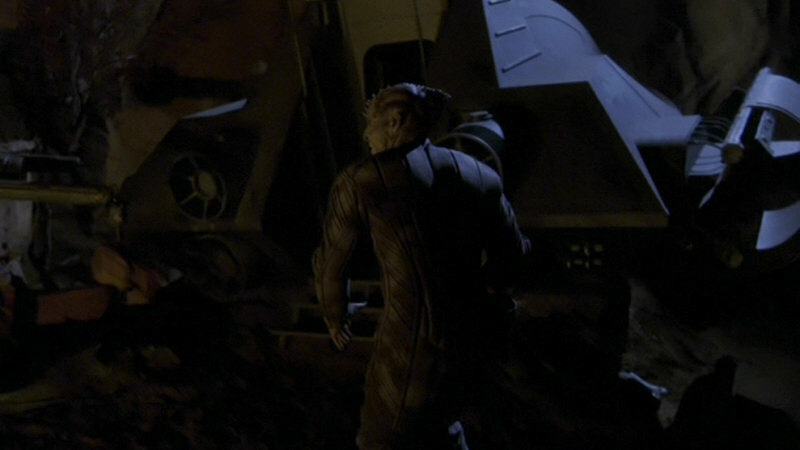 The changes to the engines on the life-size model largely correspond to those on the CG model. We can see the new oval border of the nozzles on the physical model. 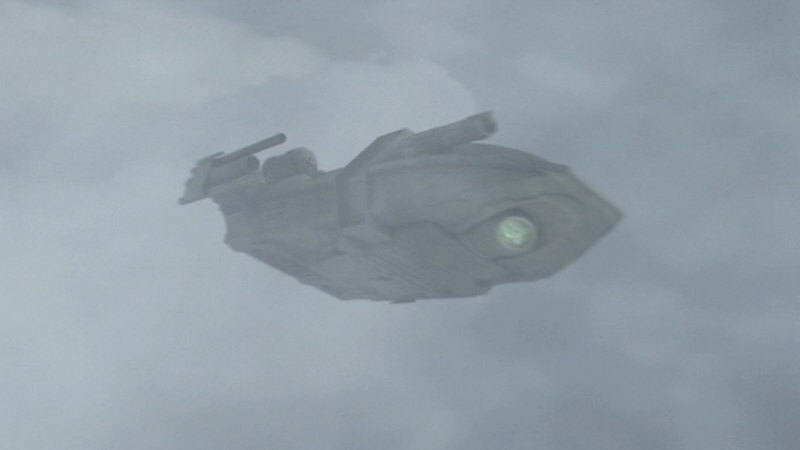 On the upper side we can make out an elongated superstructure with a raised circular part. This detail was already visible on Alice and on the Arkonian shuttle. 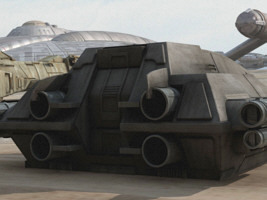 It is missing on all three corresponding CG models. 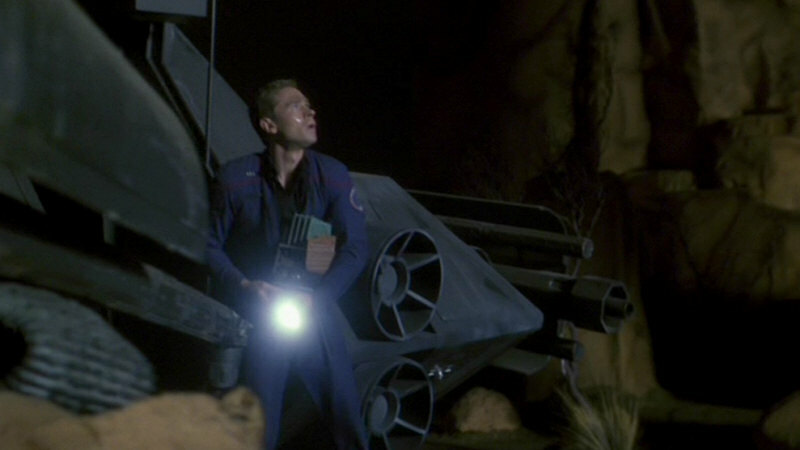 A hose sticks out from that superstructure this time, which was not included to the CG model either. 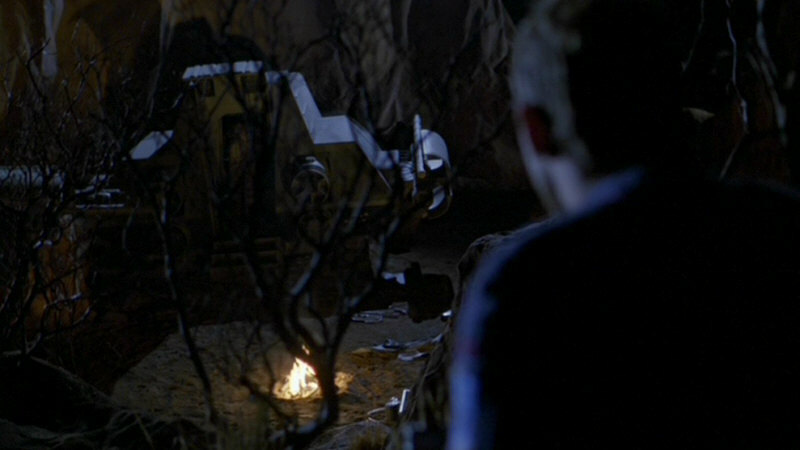 The round containers are recognizable as composters (self-replicating mines) also on the life-size model. The tubes on the lateral wings are only briefly visible. But we can take for granted that they still look like in "Dawn". 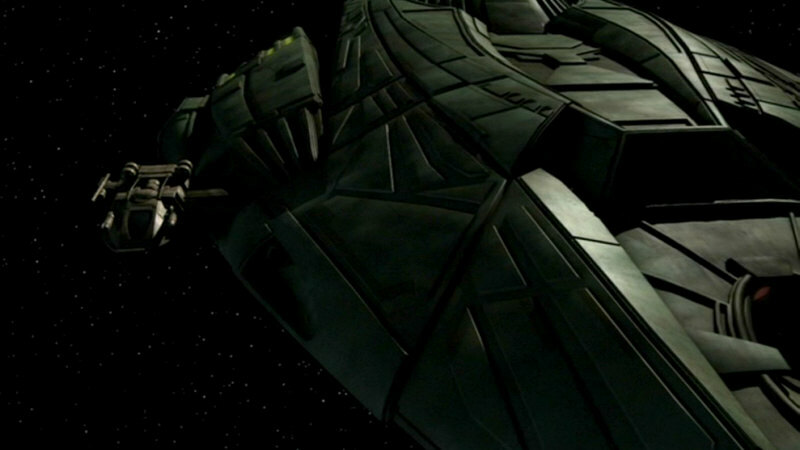 Perhaps the wings were enlarged the same way as on the CG model. 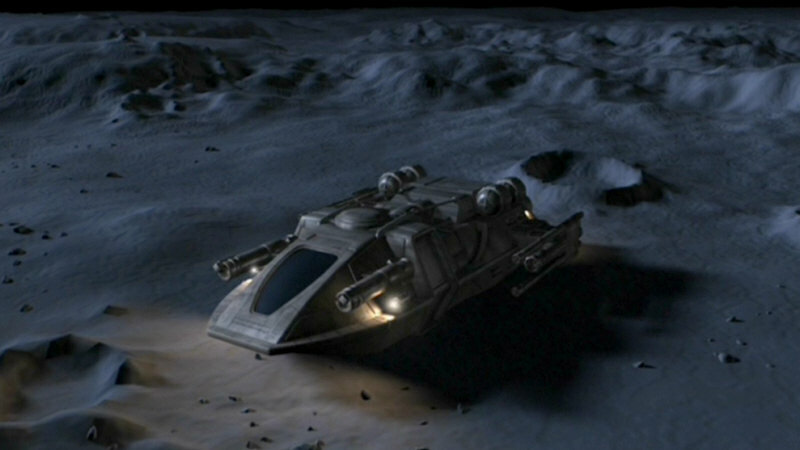 Tellarite shuttle mock-up in ENT: "Dawn"
Self-replicating mine in DS9: "Call to Arms"
We can see in the episode how Archer repairs a device (and then sabotages it). This device is located where normally the aft entrance of the shuttle was located. 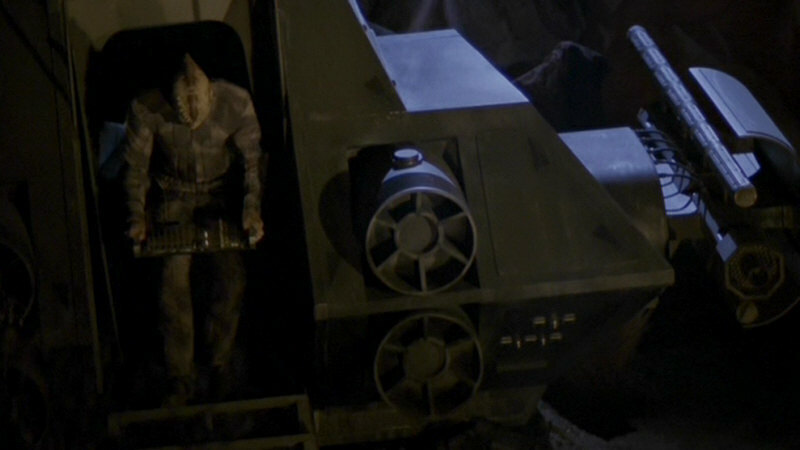 The hatch is opened, but it appears it is not meant to be an entrance hatch any longer on the Tellarite version but some sort of "engine hood". 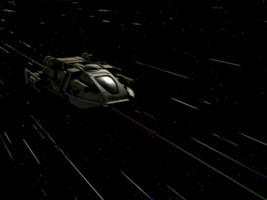 The Tellarite ship has lateral hatches for that purpose. 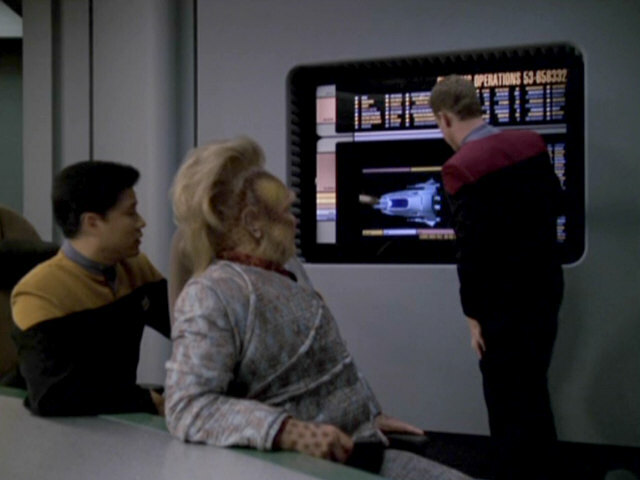 From the inside, on the other hand, we can see some sort of aft hatch. After this appearance the life-size model of Alice never showed up again. 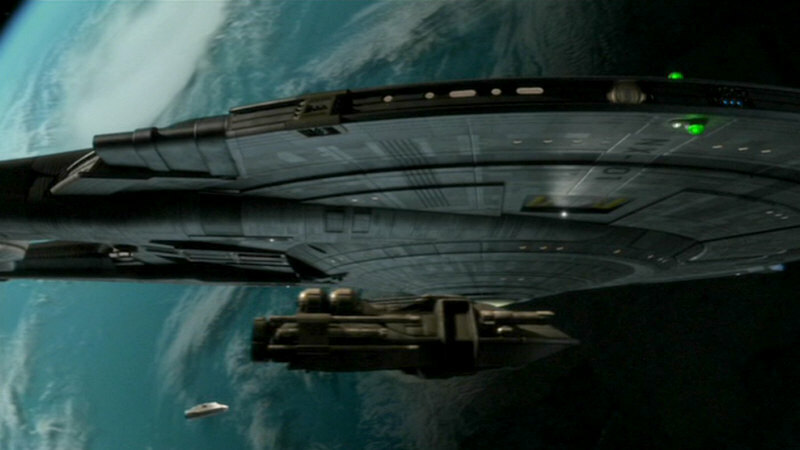 Since Skalaar's shuttle is supposed to be considerably larger and the life-size mock-up of Alice would not have sufficed for the filming, only the CG model was enlarged. It sports a middle section with the two already mentioned new hatches. The hatches are located on both sides, but we can only see the starboard hatch from the inside. 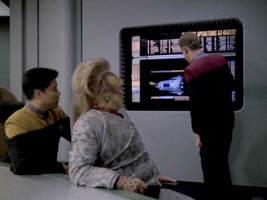 The starboard hatch is also the one that Skalaar and Archer use to leave the ship. 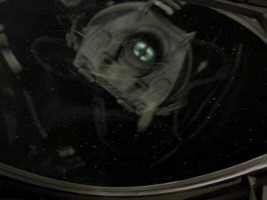 Tellarite shuttle CGI in ENT: "Bounty"
Curiously, the shuttle does not dock with Enterprise using this starboard hatch, but with another hatch that is located on to of the ship. 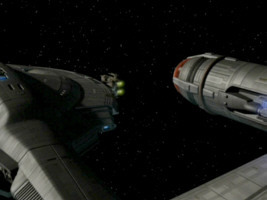 Perhaps docking with the lateral hatch was not possible because of the extended wings? 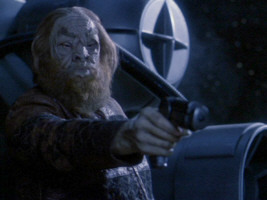 In any case, it is possible for the shuttle to dock with the Klingon ship the regular way. 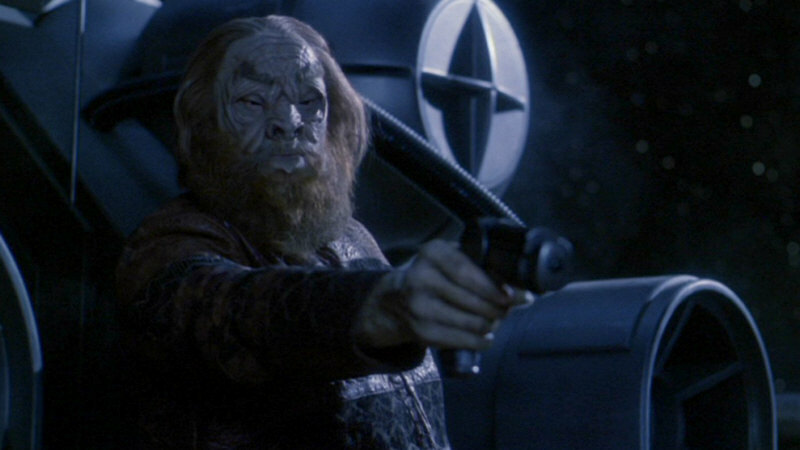 This was necessary anyway, in order to allow the Klingons to enter the shuttle set through a regular door. Yet, it is the starboard door of the set, whereas the exterior clearly shows that the shuttle is docked with the port door. 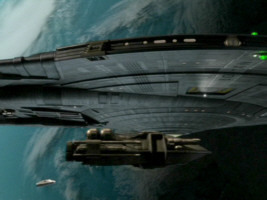 The bow of the shuttle was slightly changed with regard to "Dawn". 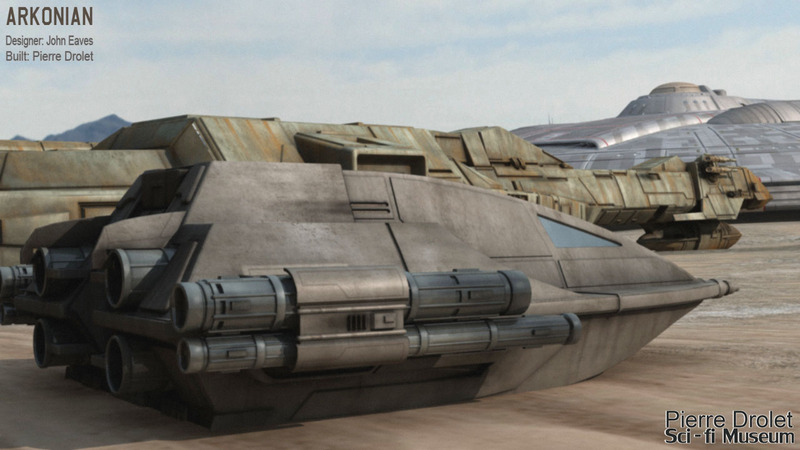 On the underside we can still spot the deflector as it was added for the Arkonian version. It shines greenish, just as the engines. If any, only insignificant modifications were made to the shuttle in this area. 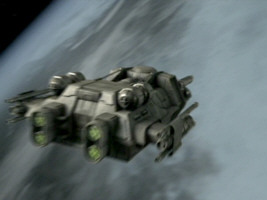 Only the two front spikes of the Arkonian shuttle were removed. 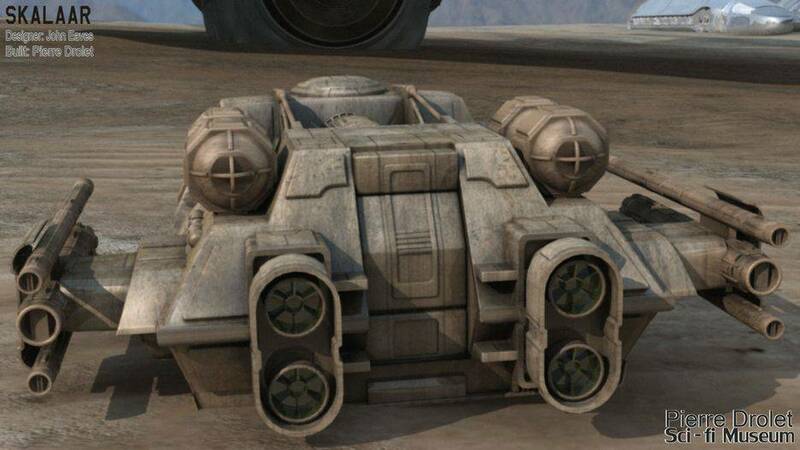 On both sides of the cockpit there are tubes that look like weapon arrays. 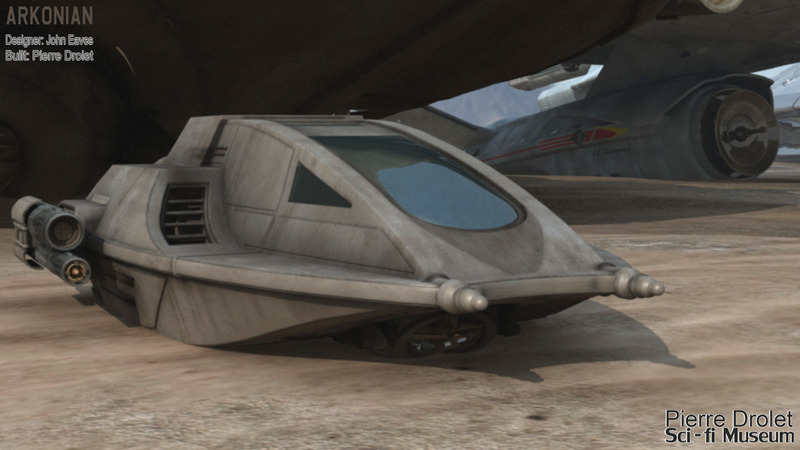 Aside from the big front window there are no other windows in the cockpit of the Tellarite shuttle. The shape of the big window was modified. It is no longer overall rectangular but tapered on its lower end. This modification has an obvious reason: The outside was adapted to the interior set. 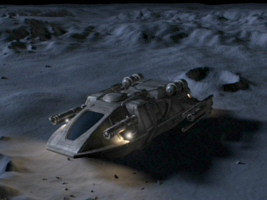 The interior set of the Tellarite shuttle is a modification of the Type-9 shuttle from Voyager. Looking at the CG model of that shuttle, we can see that it too has a front window that is tapered as seen from the outside. 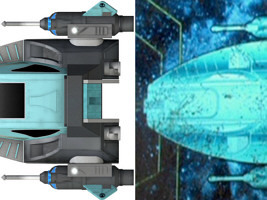 Finally, in "Bounty", we can see a graphic of the Tellarite shuttle from above. 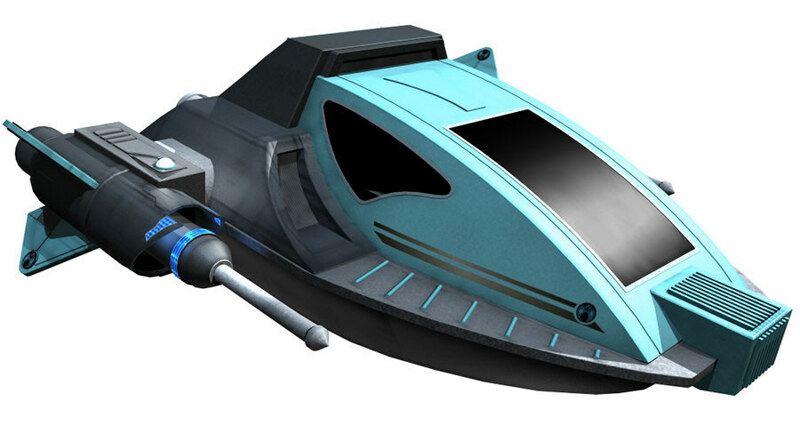 As opposed to the graphics of Alice, this one does not seem to exhibit any discrepancies to the actual CG model. 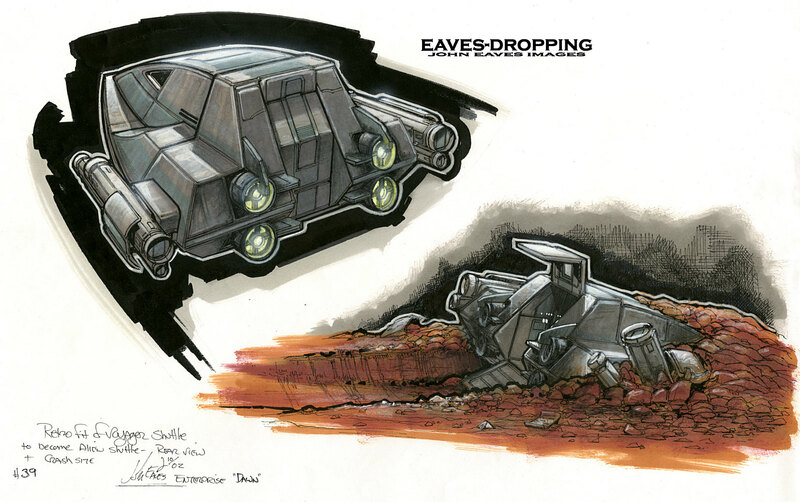 Tellarite shuttle graphic in ENT: "Dawn"
Size of Goroth's Ship and Skalaar's Shuttle - size estimation of the ships from ENT: "Bounty"
Thanks to John Eaves for the concept sketch and to Pierre Drolet for the renders of the shuttles.